When it comes to solving the puzzling syndrome known as “colony collapse disorder” (CCD), which has been attacking honey bee colonies since 2006, the best that can be said is that there is good news and bad news. The good news is that the rate of honey bee losses seems to have leveled off rather than continuing to increase. The bad news is that the cause or causes of CCD remain unclear. In the United States, the problem surfaced in October 2006, when an increasing number of beekeepers began reporting losses of 30 to 90 percent of the hives in their apiaries with no apparent cause. The defining characteristic of CCD is the disappearance of most, if not all, of the adult honey bees in a colony, leaving behind honey and brood but no dead bee bodies. This definition has recently been revised to include low levels of Varroa mite and other pathogens, such as Nosema, as probable contributing factors. 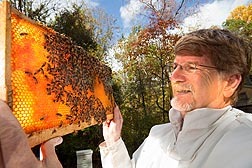 For the last 3 years, self-reported surveys of beekeepers have found that winter colony losses have averaged about 30 percent, with around one-third of those losses ascribed to CCD, according to Jeff Pettis, research leader of the Bee Research Laboratory in Beltsville, Maryland, who heads up the Agricultural Research Service’s CCD research effort. This compares to colony losses that were averaging 15-20 percent before CCD. “We know more now than we did a few years ago, but CCD has really been a 1,000-piece jigsaw puzzle, and the best I can say is that a lot of pieces have been turned over. The problem is that they have almost all been blue-sky pieces—frame but no center picture,” Pettis explains. The bee lab’s scientists have been looking for the cause or causes of CCD within four broad categories: pathogens; parasites, such as Varroa mites or Nosema; environmental stressors, such as pesticides or lack of nectar diversity; and management stressors. The researchers have been analyzing samples from healthy and CCD-struck colonies and applying a variety of stressors from the four groups to colonies in hopes of provoking a colony response that duplicates CCD. In Beltsville, Maryland, ARS entomologist Jay Evans inspects a comb of honey bees for signs of mites and brood disease. “While a number of potential causes have been championed by a variety of researchers and interest groups, none of the causes has stood up to detailed scrutiny. Every time someone has proclaimed a potential smoking gun, further investigation has not been able to make the leap from correlation to cause-and-effect for one reason or another. Other times, there hasn’t even been a scientific correlation,” Pettis says. Pathogens continue to stand out as one of the important puzzle pieces, according to ARS entomologist Jay Evans, also with the Bee Research Laboratory. He was part of a team that used genetic analyses to look for correlations between bee health and bee pathogens and activity levels of honey bee genes. 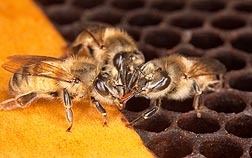 Two picornalike viruses—acute bee paralysis virus and Kashmir bee virus—along with deformed wing virus, black queen cell virus, and two species of Nosema, were found to be more abundant in CCD hives. 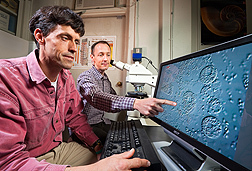 Infection by multiple picornalike viruses could result in honey bees having reduced abilities to synthesize certain proteins, the lack of which would leave the bees more vulnerable to additional stresses like pesticides, nutrition problems, or other pathogens—which sounds like a possible root cause of CCD, Evans points out. When the researchers looked at the bees’ turning on of detoxification and immune genes, which would have reflected exposure to either pesticides or disease, respectively, there was no significant difference between CCD and non-CCD colonies. Entomologist Jay Evans (left) and postdoctoral research associate Ryan Schwarz use a microscope to look at spores of the honey bee fungal parasite Nosema ceranae, which can replicate in cells lining the honey bee gut. The team did find considerable differences between CCD hives on the west coast and the east coast. “Finding Kashmir bee virus in a hive was the best predictor of CCD in the western United States, while deformed wing virus, an unrelated RNA virus, was a better predictor in the East,” Evans says. Evans and Bee Research Laboratory colleague Judy Chen were also part of an international team that closely followed 29 European honey bee colonies, carefully monitoring for pathogens, parasites, and bee proteins. This study found that fourÂ factors appeared to be the best predictors so far of winter honey bee loss: presence of the microsporidian Nosema ceranae; levels ofthe proteinvitellogenin, which strongly reflects the bee’s protein status and plays an immune system role; Varroa mite infestation; and the presence of deformed wing virus, a virus often associated with Varroa mites. Finding Varroa mites to be a good predictor of winter declines in this study was not really surprising, according to Evans, though other studies in the United States have not found as high a correlation between CCD and Varroa mites. ARS scientists are studying the transfer of food or other fluids among members of a bee community through mouth-to-mouth feeding as a possible facilitator of colony collapse disorder. Pesticides—individually and in general—have been repeatedly nominated as a cause of CCD, often without direct scientific data to support the idea. In a pesticide survey conducted by U.S. Department of Agriculture and university scientists that analyzed wax, pollen, and bee samples for the presence of 121 different pesticides or their metabolites, the most commonly found pesticides were fluvalinate and coumaphos. While about 60 percent of the 259 wax and 350 pollen samples did show the presence of at least one systemic pesticide, almost all were found at levels well below what is considered lethal to honey bees. There was no overall pattern of exposure among the samples for a specific pesticide or class of pesticides. The study did not look specifically at the pesticides as they might be related to CCD, but if a specific class of pesticides were involved, a pattern of residues should have been discernable, explains Pettis, who co-led the study. Not all pesticide impact is about directly killing honey bees, however. Sublethal doses of the pesticide imidacloprid—one of the neonicotinoid group of pesticides—were found to make honey bees more susceptible to the gut parasite Nosema, according to a study by Pettis and University of Maryland researchers Dennis vanEngelsdorp, Josephine Johnson, and Galen Dively. 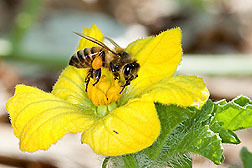 A honey bee, with pollen attached to its hind leg, pollinating a watermelon flower. The researchers fed three generations of honey bee colonies either 5 or 20 parts per billion (ppb) of imidacloprid, which is used to protect a wide variety of crops and ornamentals from many different insects. The dosages used in the study were intentionally well below the levels that have been documented to kill honey bees after short-term exposure and reflected levels that have been measured in the environment. After the third generation, newly emerged adult bees from these colonies were exposed to spores of N. apis and N. ceranae, gut parasites that have been a growing problem for U.S. beekeepers since the 1990s. There was up to a fourfold increase in the levels of Nosema in honey bees from the imidacloprid-exposed colonies, regardless of whether 5 or 20 ppb were fed. “While these increased Nosema levels were found in individual bees, there was no measurable impact at the colony level,” Pettis says. “Imidacloprid was chosen for this study because of its widespread use and beekeepers’ concerns about it. But it was only found in 3 percent of the pollen samples checked in the pesticide-survey study, usually at very low levels, and no connection with CCD has ever been made scientifically,” he adds. To better account for such sublethal impacts, Pettis is working as part of an international group of scientists and regulators to help the U.S. Environmental Protection Agency (EPA) develop recommendations for pesticide-testing guidelines that factor sublethal effects into test protocols. ARS scientists have already developed a sublethal-impact cage assay that has been provided to EPA. Could imidacloprid and Nosema together be the cause of CCD, as some claim? “This study did not look for nor establish any connection between either imidacloprid or Nosema and CCD,” Pettis explains. 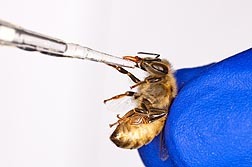 “But the effect of the combination of imidacloprid and Nosema demonstrates that there are many complex interactions between stress factors that need to be considered in looking for a cause of CCD and high honey bee mortality in general.”—By J. Kim Kaplan, Agricultural Research Service Information Staff. To reach scientists mentioned in this article, contact Kim Kaplan, USDA-ARS Information Staff, 5601 Sunnyside Ave., Beltsville, MD 20705-5128; (301) 504-1637. Colony collapse disorder (CCD) has been a subject of interest in scientific journals and the popular media since the syndrome first appeared in 2006. Despite numerous and differing claims, nothing has actually been shown to be the cause of the problem. One or more pathogens remain scientists’ most likely choice as the cause or partial cause. But various viruses and bacteria have had higher correlations with CCD in different parts of the United States and in different countries. Before any pathogen can be legitimately accepted as the cause, science must demonstrate that when it is introduced into a healthy colony, CCD results. A parasite is the other perennial suspect, either by itself or in combination with one or more pathogens. Nosema and Varroa mites remain high on the probable-cause list. Some believe that a previously undiscovered or unidentified pest or pathogen is involved in CCD. But claims that such an agent has been identified have not held up scientifically so far. There are many classes of pesticides to which honey bees can become exposed. Among those that have been stamped with a “CCD cause” label are the neonicotinoids, like imidacloprid and clothianidin. One issue with making that link is the lack of a matching pattern between neonicotinoid residues in colonies and CCD outbreaks. France, which banned imidacloprid in 1999, and Germany, which along with France banned clothianidin in 2008, still have CCD problems. Pollination-service beekeepers stack colonies on tractor-trailers and transport them thousands of miles during the growing season. For honey bees, orientation to their hive is vital, and being regularly relocated must be stressful. Additionally, moving hives around the country may spread diseases and pathogens as honey bees intermingle in the fields. It is possible that such stresses play into CCD, but there is no scientific evidence of it at this time. Wild honey bees forage on a wide variety of nectar sources. Honey bees used for commercial pollination are mostly limited to one crop at a time, and it is possible that they may suffer nutritional deficiencies that stress their immune systems. Genetically modified (GM) crops, most commonly Bt corn, have been offered up as the cause of CCD. But there is no correlation between where GM crops are planted and the pattern of CCD incidents. Also, GM crops have been widely planted since the late 1990s, but CCD did not appear until 2006. In addition, CCD has been reported in countries that do not allow GM crops to be planted, such as Switzerland. German researchers have noted in one study a possible correlation between exposure to Bt pollen and compromised immunity to Nosema. Some researchers have attributed CCD to the practice of feeding high-fructose corn syrup (HFCS) to supplement bee colonies. But there are many reports of CCD occurring in the apiaries of beekeepers who do not feed HFCS. Others have suggested a possible connection with HFCS produced from genetically modified corn, combining two popular villains. But the simple management change of not feeding any HFCS does not stop CCD. Weather changes, such as unusually warm winters, earlier springs, drought, and flooding, can lead to changes in flowering times. Plants may blossom early, limiting nectar and pollen supplies. But bees used for pollination contracts are moved to fields to coincide with flowering of crops. Still, some believe global warming is to blame, if only in part, for CCD. The level of the air pollutant ozone has been steadily dropping since the early 1990s. Since CCD did not appear until 2006, the timing doesn’t match for ozone to be related. The idea of cell phones causing CCD began with the misinterpretation of a study in which a cordless home phone, not a cell phone, was shown to have some impact on honey bee navigation. The study author has repeatedly stated that the phone he tested is nothing like a cell phone and has nothing to do with CCD. But the idea remains popular. 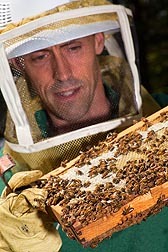 One of the most recent “proofs,” (published in Current Science in 2010) claimed evidence suggesting “that colony collapse does occur as a result of exposure to cell phone radiations” while also reporting that the impact of cell phones in both of the test hives resulted in more bees staying in the hive longer—the exact opposite of the definition of CCD. "Colony Collapse Disorder: An Incomplete Puzzle" was published in the July 2012 issue of Agricultural Research magazine.